elopment Center (NMDC) incorporating disaster contents in its journalism-training curriculum organized a five-day Journalism Training Focused on Disaster Reporting in Arghakhanchi. Department of Information (DOI), Ministry of Information and Communication supported the programs. The training was organized from 17-21 June 2015 in coordination with Federation of Nepalese Journalists (FNJ) Arghakhanci branch. In the training, there were 23 participants including 10 women reporters. All of them were working journalists. It was new training to 15 participants. Participants of the five-day training learned about the basic principles of journalism together with the concept of disaster reporting. They become able to identify issues of news, write news on structure and use sources. They also learned about disaster and disaster reporting. Participants actively participated in 6 field and class exercise. It inspired participants for practice. Gained knowledge about disaster, disaster reporting and code of ethics. Deputy Director General of Department of Information Bishnu Bhakta Ranjit, Assistant Chief District Officer Khagendra Poudel, Local Development Officer Hari Prasad Gyanwali jointly inaugurated the five-day training in Arghakhanchi on 02 Asar 2072. At the inaugural session, Bishnu Bhakta Ranjit said, ” Factual information provides relief to the citizen.” He also informed that DOI had provided SMS services to media persons during earthquake. At the session, guests from the government, media houses and local social organizations expressed their happiness about organizing the training at Arghakhanchi. At the session, speakers highlighted upon the role of journalists, trends of journalism in Arghakhanchi, and relationship between the government officials and journalists. Bishnu Prasad Sharma, Executive Director of NMDC highlighted the content, objective of the five-day training. 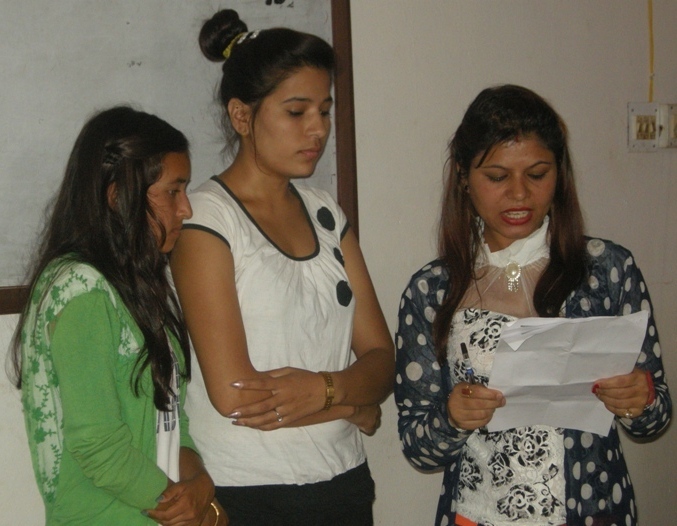 He also informed them that it was NMDC’s 84th journalism training conducted in 65 districts of Nepal. He also mentioned that NMDC’s commitment to enhance reporter’s skill on disaster reporting following safety guidelines and code of ethics. Deputy Director General DOI Bishnu Bhakta Ranjit, trainer Laxman Adhikari, local resource persons Khagendra Poudel, Shovakhar Panthi and Bishnu P Sharma had facilitated the five-day training. Activities of DOI, communication, principles of journalism, news, types of news and elements of news, news structure, news writing techniques, sources of news, types of disaster, disaster in Nepal, disaster reporting tips, code of ethics for journalists, social media, development journalism, and field reporting were included. Chief District Officer presented their plans and schemes for disaster management. Participants had participated in several class works as well as field reporting. At the end of the training, a brief closing session had also been organized. Senior local journalists were also present in both sessions. 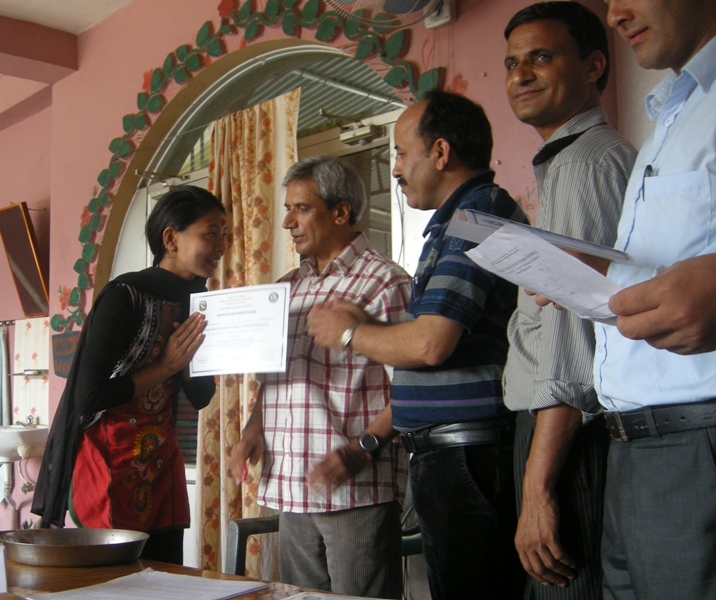 Trainer, NMDC representative FNJ President distributed the participation certificates. All of them wished that the training surely had provided knowledge and sharpened their reporting skill. Trainees expressed happiness for having opportunity to participate in the valuable training. Deputy Director General of Department of Information, Bishnu Bhakta Ranjit presented on- “Introduction to Department of Information and special services to media during pre and post earthquake “. In his presentation, he briefly explained about the provision of press freedom, press and publication act, minimum wages of journalists and procedures of newspaper classification. He encouraged the journalists to join media houses only after taking appointment letter; so that- they are ensured for salary. Training Session-III: Trainer Laxman Adhikari presented about the introduction of News. He explained on definition of news and news elements. He gave several examples of definition of news. Participants also defined about news based on their own experience. Assignment – Class -1: Participants had to share their views and ideas about the definition of news. Training Session-IV: Another session was about Elements of News. Trainer Adhikari explained about different elements of news. He explained in detail about the principles of the journalism such as –ABC –accuracy, balance, and credibility. He further explained about the qualities of news. Without verification, news should not be dispatched, he said. Assignment-2:At the end of the session, participants had to bring five different issues of news that they think are important in their areas. Day 2: 18 June 2015, Thursday (03 Asar 2072): At the beginning of the second day, trainer provided the role of spokesperson, entertainer and report writer to the participants. Then, participants on individual basis shared the learning of the first day. The reporter read the report; the participants and trainers provided feedback on it. 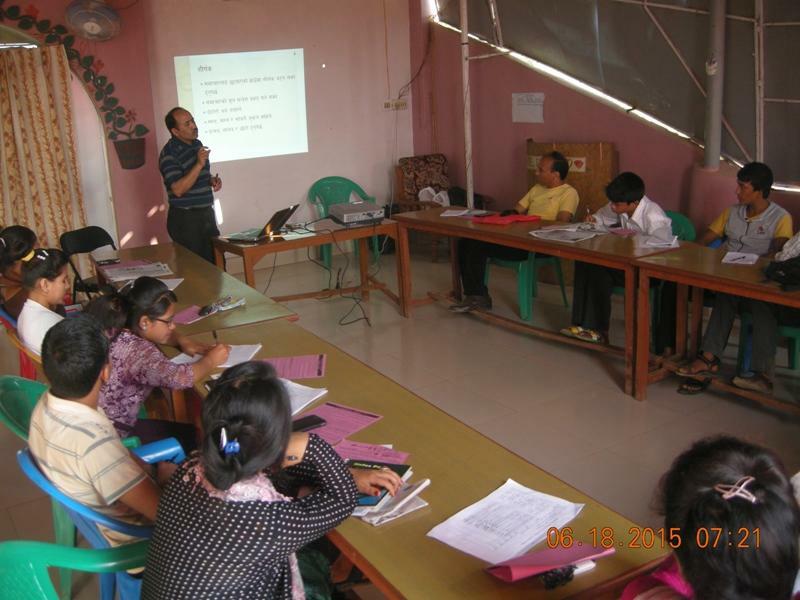 Training Session-V:Trainer Bishnu P Sharma presented on- “Brief history of journalism from stone age to New Media”. He informed the participants about the development of communication and journalism. He gave some examples of instruments such as drum and conch that were used for communication. Now, people are using different tools such as mobile phone, social media, radio, TV, online to communicate, he explained. He said, at this era every person who is able to purchase a mobile phone and use it, becomes able to see the globe and inform to the globe. He also informed them about different phases of the development of Nepali journalism. 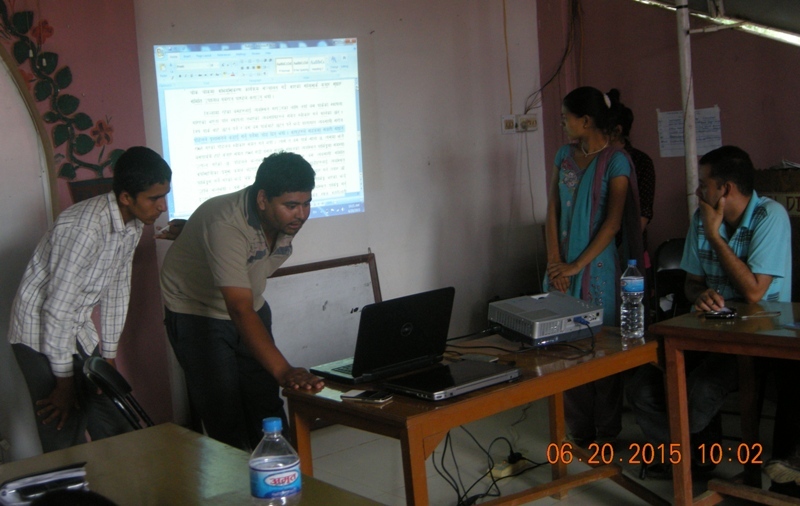 Trainer Laxman Adhikari presented on- “Structure of the news” such as – head, sub-head, dateline, by line, and lead/intro. He explained in detail about the inverted pyramid and the principle of 5W1H. During presentation, he explained about the news writing style, news sources, and types of sources, techniques and tips used to collect information from different sources. He also commented on the strong and weak points of the content and format of the local newspapers. Training Session –VII: Trainer presented on- “Source of the news.” After explanation, he asked them to list down both the informal and formal sources. Assignment-3:Participants had to list down the sources that needed to make balanced news. Training Session –VIII :Trainer Laxman Adhikari presented on news angle and the importance of news angle. At the session, he briefly explained about the news angle, and importance of news angle while writing news, and advantage of news angle. Good reporters always write on single news angle. Assignment-4: Trainer provided basic information of disaster and asked them to write news following the news structure. All participants actively participated in the class exercise. Trainers immediately provided feedback to their presentation. Day 3: 19 June 2015, Friday (04 Asar 2072): Participants shared key points that they had learned on second day. Exercise of identification of sources, class exercise, news structure, historical development of the role of new media and its impact to the youth and news angle were important learning points for them. As in second day, responsibility of the role of speaker, report writer and entertainer was also specified. Training Session IX:Trainer Laxman Adhikari presented on “Disaster Reporting”. At his presentation, he informed them on: the concept of disaster, definition of disaster, types of disaster, and disaster in Nepal and disaster preparedness.He gave some figures about disaster. Nepal is in earthquake zone. Major disasters of Nepal are earthquake, flood, landslide, dry landslide, he explained. He also informed about natural as well as people made disasters. What could be the role of media in disaster? Journalists should always provide information based on facts. They should not report on assumption and news report should not create fear to the people while writing on disaster. He gave some cases. Some online had provided false information saying about eruption of volcano in Kapilbastu. That was a fake news. National News Agency sacked the reporter who had reported such false news. He also informed about three phases of reporting-pre disaster, during disaster and post disaster. If media provides information about landslides or flood before monsoon, local people, Red Cross and government units becomes alert and response to minimize human and property loss. At the session, cases of news coverage by national and international media about the recent earthquake of Nepal that had occurred in 25 April 2015 were presented. Participants clearly understood that Nepali journalists and media had to be alert for disaster reporting. Trainer Laxman Adhikari briefly explained the participants about: “Interview Skill”. In the session, he explained about definition of interview. Then, he explained about three types of interview underlined by Mc Leish Robet:Informative, Interpretative and emotional. In general term, there are personal/profile interview, views interview and news interviews. He also highlighted on phases of interview. They are: pre interview, interview and post interview. He gave useful tips to the participants. Assignment-5: Orientation to Field Reporting: After presentation session, the participants were divided into 5 different groups. They were asked to choose a topic, potential sources to make the news authentic. After news preparation, they had to present on the following day. 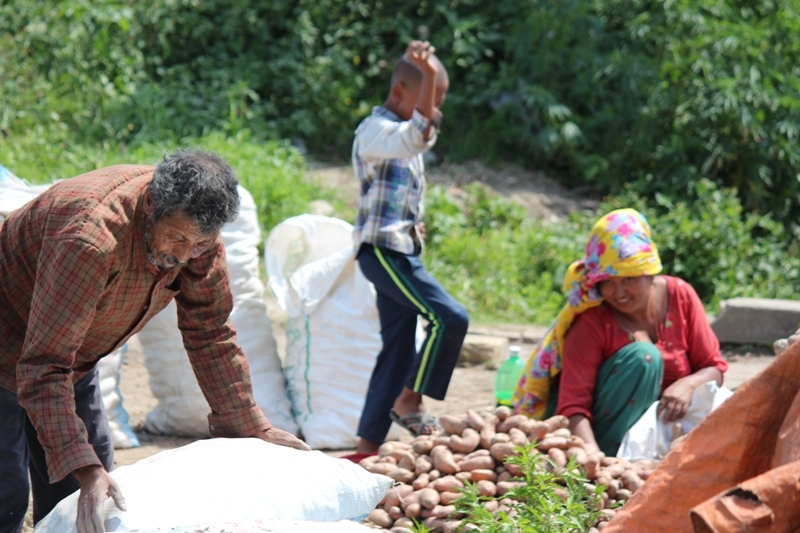 Sapana/Amrit/Sagar/Muktinath Dairy Production in ArghakhanchiDay 4: 20 June 2015, Saturday (05 Asar 2072): The participants shared third training day’s learning and first experience they had gained from field reporting. According to their field reporting practice, they had come to the point that early preparation was essential before visiting the sources. This was a great achievement for them. By visiting field, 5 groups had prepared news in selected topics as mentioned above. The group leader presented the news in front of the participants, guest and trainers. Fellow participants and trainers had provided feedback on the news report the group had prepared and presented. Training Session – X: First group presented on “Paddy Plantation”. Though their news was not focused but they had collected authentic information and had done hard work. They had to be clear on news angle. Similarly, “Dairy Product” was another field reporting of the fifth group. Trainers suggested that the news report was longer and could be break into several angles. Another group presented on ” Child Delivery Service in district hospital.” They had used reliable source to make the news authentic and it was on structure. The participants were happy and confidence to become good reporter. “Unmanaged Parking” was another topic that the group presented. Trainers provided feedback on the news. Another group presented on “Helpless Children”. How did they become helpless or street children? The group had tried to raise the issue properly. All of them had presented perfectly. Training Session – XI: After recapitulation, FNJ President Shovakhar Panthi briefly presented on: “Disaster Reporting Experience in district: Case Presentation. At the session, he mainly focused on factual reporting. He gave examples of some news that had mentioned about death of 25 persons which later was proved false. The number of death was only 18. Without double verification, one should not transmit news. In disaster reporting, we should provide information about disaster keeping ourselves safe. Journalists become famous only from news not from other activities. And, the news whatever we provide should be balanced, he said. Collection of list of persons who died in other districts/areas. Distribution of relief to all victims on the basis of their loss. Strengthen the Disaster Preparedness and Response Plan Committee. Make active and effective 8 clusters/units constituted to response the disaster victims. Training Session – XIII: Trainer Adhikari presented on Press Release & Press Conference, News Language and Op-Ed Writing, New Media and Role of Citizen Journalism. He also briefly informed about ‘How to write correct Nepali?’ Trainer presented on the importance of the use of correct words while writing news both in electronic as well as print media. He encouraged them to write using simple and common words. The language should be comprehendible to all. Journaligained tips to make short and effective news from press conference and press releases. How social media and new media helped in providing immediate relief services to the disaster victims.gained tips to make short and effective news from press conference and press releases. How social media and new media helped in providing immediate relief services to the disaster victims. Assignment: 6:Training coordinator distributed Press Council’s press release among the participants to read contents prepare news. 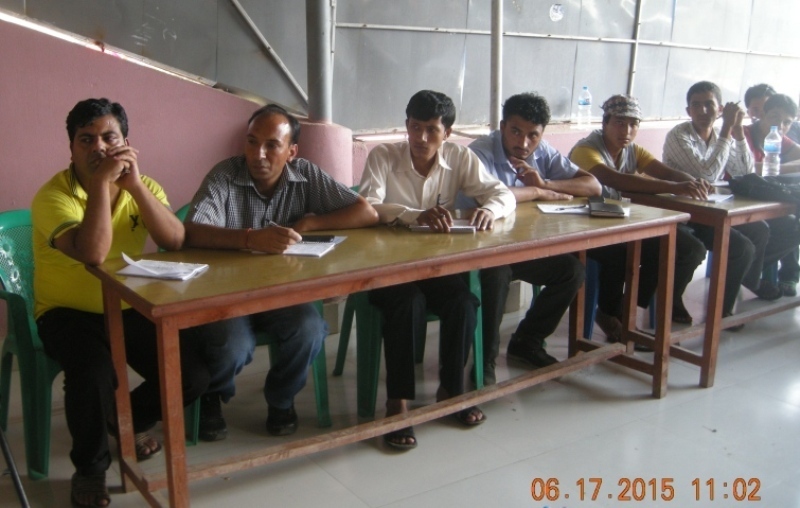 All participants had prepared news and trainers provided feedback involved in the exercise. 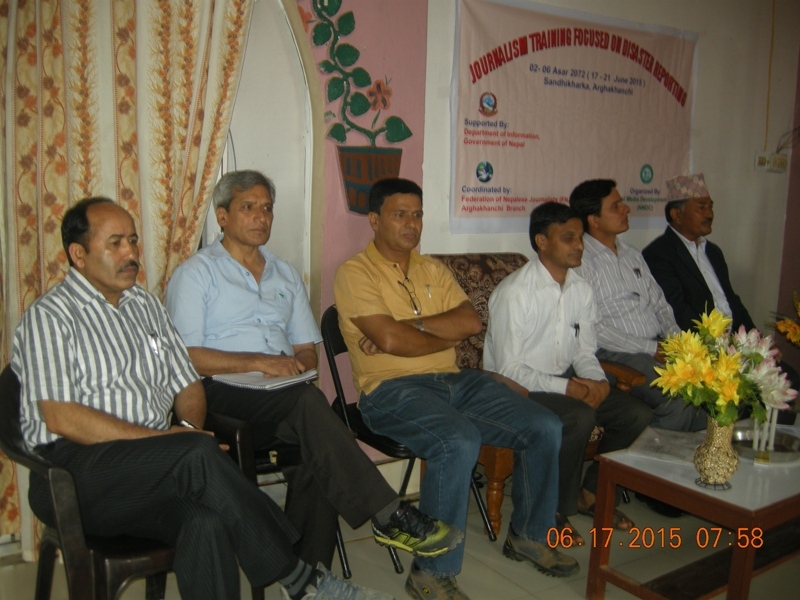 Day 5: 21 June 2015, Sunday (06 Asar 2072): Participants shared their experience of previous day. One of the participant journalists presented the report of the fourth day. The resource person recapitulated and reviewed the contents. Speaker, entertainer and report writer for fifth day’s training were also selected from the participants. Training Session: XIV: Bishnu P Sharma presented on the topics on- “Code of ethics for journalists, guidelines of the journalists and maintaining district profile”. During presentation, he informed about the code of conduct prepared and monitored by Press Council Nepal( http://www.presscouncilnepal.org/). He had explained what and how they had to report about disaster. He also gave some tips that are essential to be a good reporter. He encouraged them to compulsorily compile a profile of the district where they work. Training Session: XV: Trainer Laxman Adhikari briefly highlighted the concept of “Development Journalism”.He briefly mentioned about people, resource and expert that is essential while writing development news. He also gave background information of development journalism, importance of development journalism, elements of development reporting and techniques of development writing. He explained that reporter should not forget to tell about the impact of the event. FNJ President Shovakhar Panthi had chaired the closing session. At the session, local senior media persons had told that the new trainees had the working opportunity to work in local media if they implement the learned skill by writing news. They jointly distributed certificate to the participants. 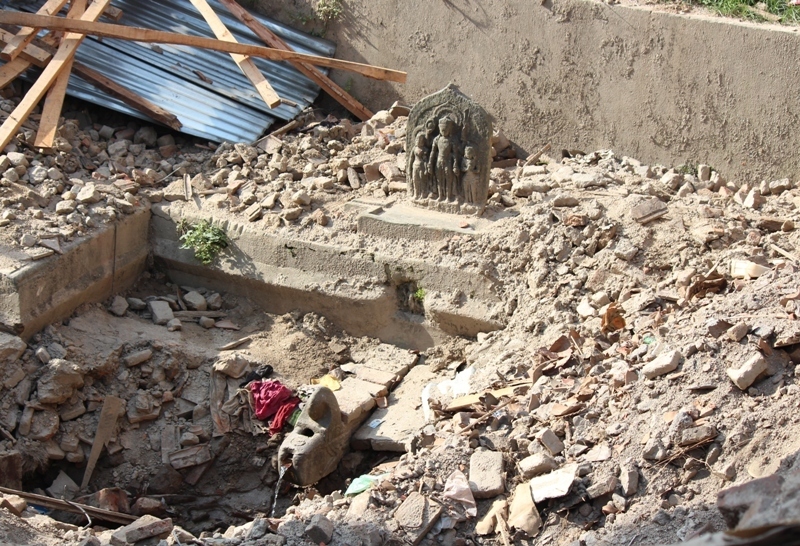 The devastating earthquake with 7.9 magnitude of 25 April 2015 showed its brutal character by demolishing the old, historical, culturally rich town Sankhu. ‘Within 30 second all the houses were collapsed and 82 people had died. If the quake had occurred at mid-night, all the people of Sankhu would have been died. It was the goddess Bajrayogini who saved us’, Jagatram Shrestha, 72 from Sankhu said. Sankhu, a Newar village rich in Newari culture is 17 km east from the capital cityKathmandu Sankhu. 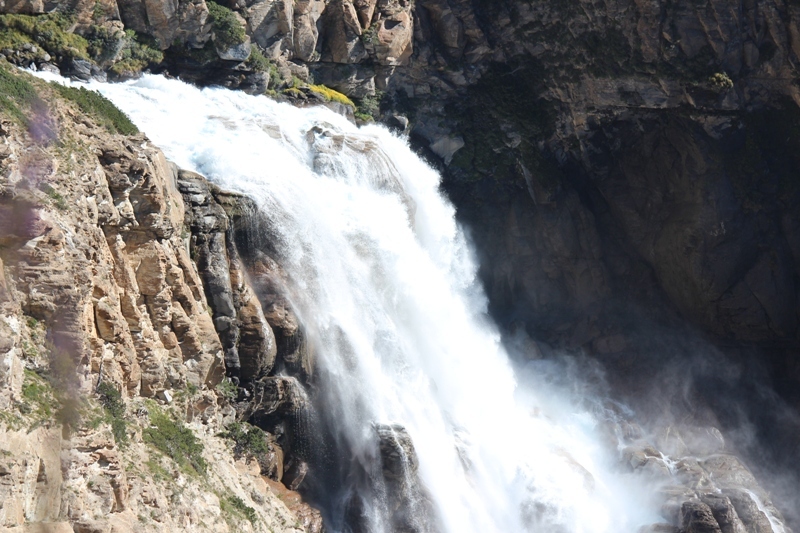 It is a small valley situated in the bottom of Manichud hill and Shali river. Sankhu also an important place of trade with Tibet in ancient times is still attractive in Newari culture and its way of farming. 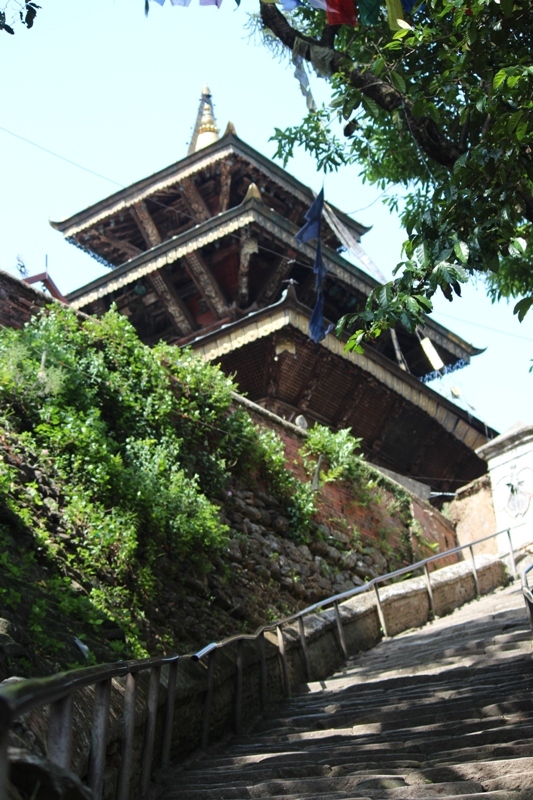 It was the touristic center, where many tourists from all over the world used to visit the valley to see the live Newari culture and ritual, old style houses, beautiful courtyards, carved wooden big windows, several pagoda and shikhara designed temples and stone sculpture, carved stone water spout in the old town. 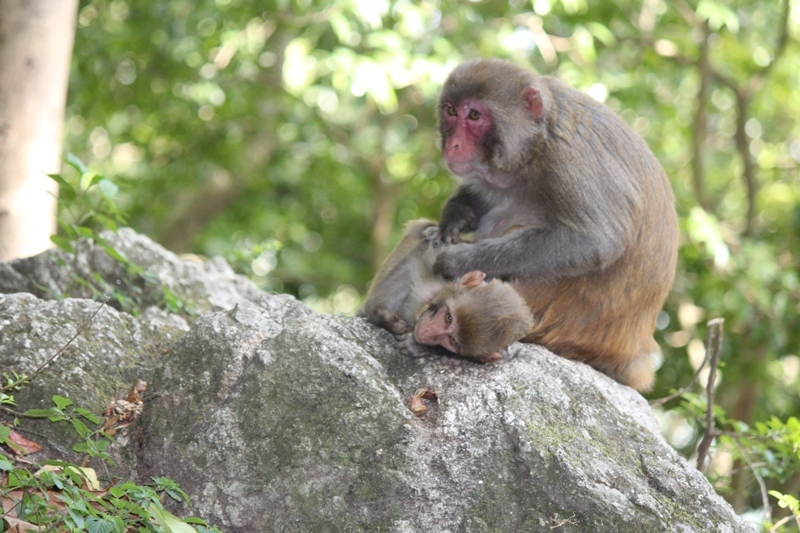 Although near the capital city, modernity had not damaged the town until the devastating quake. The luring tall brick buildings with attractive carved windows, deep well used for drinking water, narrow streets, temples and stone images in each courtyard, small shops, hard working people were the live symbols of Sankhu. I have visited Sankhu several times. It provided me with fresh air and satisfaction to my heart. The green farmland, old houses, stone statues, huge old carved wooden hanging windows, small and narrow lanes, small shops with local taste, deep green forest and Bajrayogini temple at hilltop always lured me. The recent visit that I had done few years ago with an American journalist Stephen Franklin and his wife and my French friend Claudine Rubin and her team had provided me a very fresh memory in my mind. I do not remember if Franklin had written about Sankhu but I have a fresh memory of his serious look over every part of inner-Sankhu. Whatever I had seen around Sankhu along with my friends had come into my mind as I was turning the pages of a book. Therefore, I was shocked and trembled when I heard about the loss of the people and destruction of all the buildings. I became able to visit Sankhu only after one month on 25 May after the first terrible quake that hit the nation at 11:56 am on 25 April and took the life of 8673. About half million houses were crumbled down to earth. I parked my motorbike at the left side of the entrance of concrete gate and headed forward. To the right side of the road to Bajrayogini, I could see no single house standing in good position. Some were totally fallen down. Those, which were not crumbled down to the earth, were broken. Some houses were broken in front side and others were broken to back side. Some were brutally cracked from bottom to top. Standing near a Peepal tree to the right corner of the street from where I had entered with Franklin and Claudine’s group and had showed them inner Sankhu, tried to mark the beautiful big wooden carved window, that was not there any more. The house was fallen down to earth. Not only that-the narrow street that lead to the heart of the town was blocked with debris of the fallen houses. It was not cleared and cleaned up. I could not stand up. My legs started trembling. I sweated and lost energy. So, I stepped back and sat on a stone in safe side. The pain, I felt there, was harder than the pain I had felt looking my own four corner cracked house (It is not crumbled down but unsafe to stay) where I was born (Ranipani, Parbat west Nepal). I felt that Sankhu was not only my old town but it was also a home of my friend Franklin and Claudin and many more. So that it made me more panic-perhaps. I took the street to Bajrayogini looking at the monster dance of the earthquake that had not left anything from its brutal claws. It looked so ghastly and horrible that I had even never heard in fearful folk story. 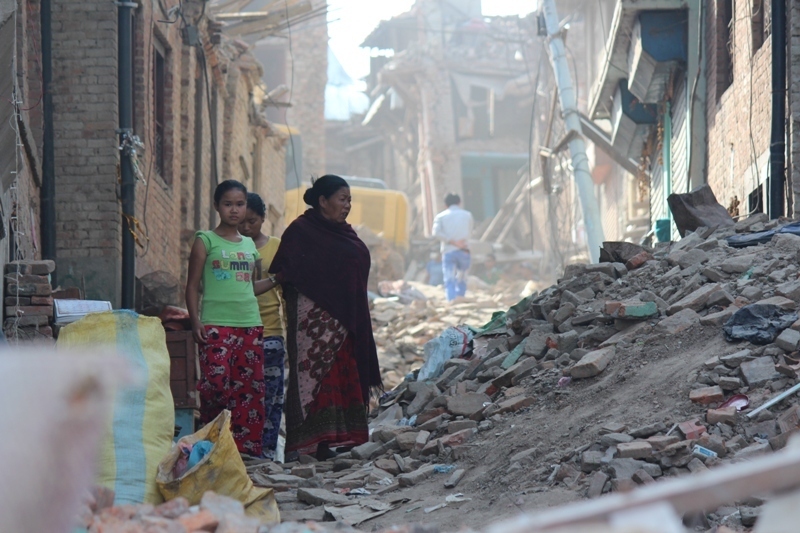 Nepali security personnel and local people had started to take out their belongings from broken houses. Some were collecting pieces of wood, some were separating bricks from the debris and some were breaking the remaining walls and others were carrying the dust in the open terrace. There was a cloud of dust in the street. I saw only one of the streets of the inner town cleared across to another street on the day when I visited. All other small streets were still closed. Despite this, house owners had visited their houses and they were trying to take out their belongings uncaring the risk. 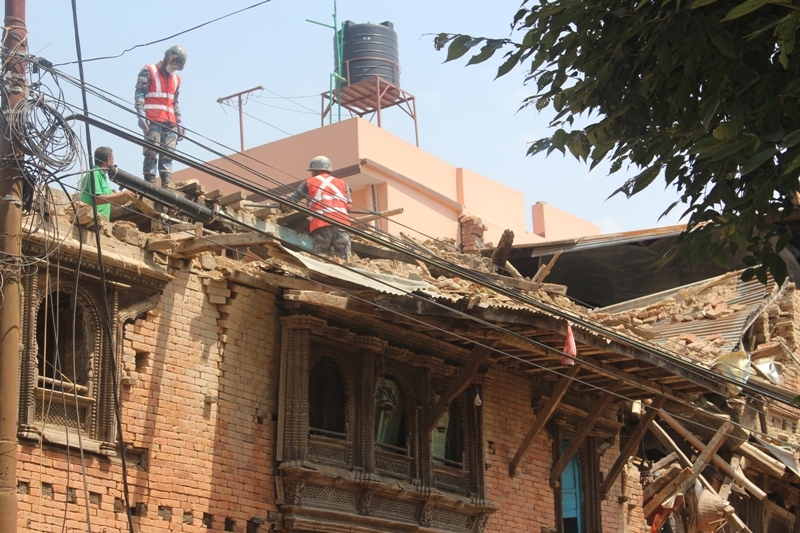 It is not only the old brick houses fallen in Sankhu, but new concrete houses were also badly broken or severely cracked. Except two houses in Sankhu, all were broken in the earlier greater earthquake of 1934 that had also taken the life of more that 8000 people in all over Nepal. This time too, no one of the houses made of brick are saved, Jagatram who was sitting at the bottom of the hill under the shadow of the tree, said. He said his three storied house is also broken. It will take more two weeks to clean debris to reach to his house. Now, his family is staying under a tarpaulin. The total destruction in both earthquakes clearly suggests that there should be a geological taste before rebuilding the houses in Sankhu. I toured the town. I tried to see the center of the city. But, it was in vain as it was blocked by the fallen houses. Many streets still need to be cleared. I also did not see outside volunteers, tents and temporary hospitals as I had heard in the news. The one I saw a tent was of from the Red Cross. Sankhu is not only famous in its culture, wood carving, stone inscriptions, beautiful courtyards, and water spouts, it is also very famous in rice, wheat and vegetable production. Some farmers were seen busy harvesting wheat and potatoes. And, some men and women were already in the rice field for paddy plantation. Some young boys and girls were building temporary shed collecting old corrugated iron sheets and bamboos. 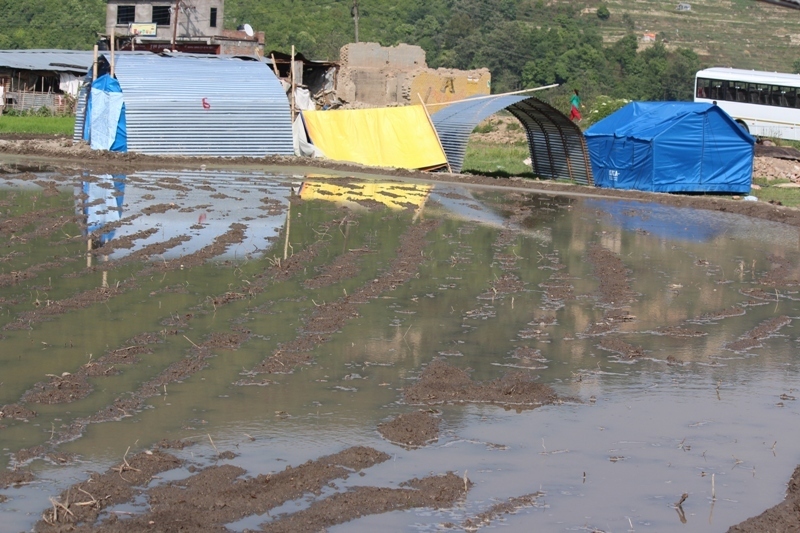 The single tarpaulin distributed by the government and international organizations named Tent were already torn out. And, old couples were slowly separating the bricks and rotten pieces of wood from debris. I climbed up to see the situation of the Bajrayogini temple, which is the pride of Sankhu. Lonely planet had also listed the temple in its travel guide book. The king, Pratap Malla had given a new look to the temple in 1655. It is a pagoda style temple with a three-tiered roof of sheet copper. There are two pagoda style temples in the main courtyard. One is the Vajrayogini Temple with a three-tired roof of sheet copper. Its main gold plated gate is decorated with the images of goddess and tantric symbols. 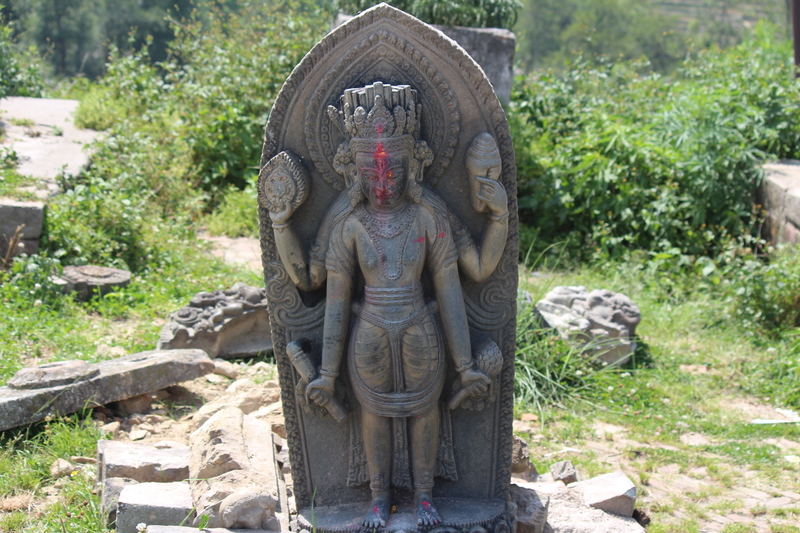 Another temple is the Chaitya is said to be naturally made of and is worshiped as Ugra Tara. Wood carvings, carved stone water spouts, stone images and stone inscriptions are other properties of the courtyard. The main temple is badly cracked to the left part of front and back side. And there are many cracks to the back part of the temple. One can clearly notice it has slightly tilted to the west side. When I reached there, the priest had just opened the main golden gate and I had the opportunity to see the main images of the goddess Vajrayogini. I prayed her to protect herself and the inhabitants of Sankhu and beyond. Now, if we listen on radio, watch on TV programs and read in the newspapers and online, there are innumerable ideas and discussions coming up about rebuilding Nepal. The Nepalese experts are mixing their sounds with foreigners and are shouting about reconstruction and analyzing the destruction. I saw now in TV so many Nepali geologists and engineers holding key post in government office, whom I never had noticed nor seen in TV programs or in radio or newspapers. What were they doing in the past? Where were they using their expertise? What were they doing when different companies or individuals were constructing high-rise building in earthquake prone zones? I had never seen them. I had never read their articles about the seismic and geological situation of Nepal . Rather they were hesitant to give information. 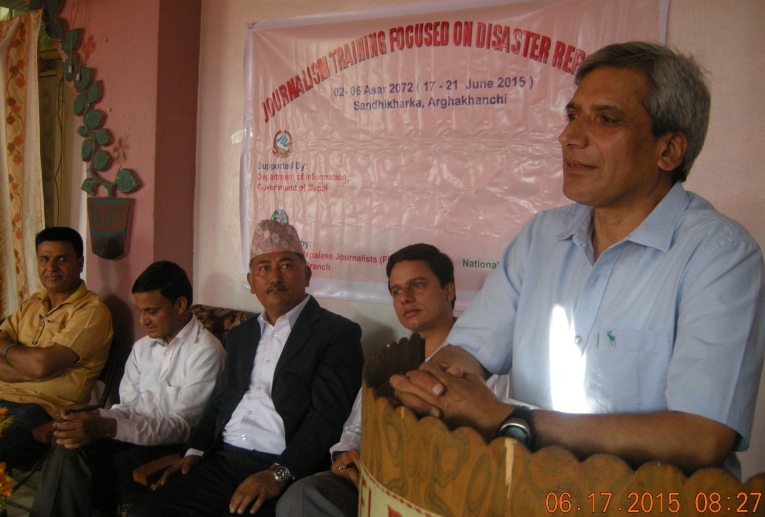 If some activities carried on disaster management awareness building were only by the USAID. Nepali media also failed to bring the disaster issue to the public. I myself also failed to bring the issue to the attention journalists. Bhailal Deula inhabitant of Sankhu whose leg was fractured in the second quake of 12 May said, no one had given a concrete idea about the rebuilding of Sankhu. He said, “The inhabitants of Sankhu themselves should be cautious to protect the pride of Sankhu’. “I agreed with what he said. I personally do not know if some representatives of Department of Archeology, Government of Nepal and UNESCO Kathmandu have reached to see the situation of the crumbled 3000 years old ancient town. In my view, Sankhu is as important as other heritage sites such as Kathmandu Durbar Square, Bhaktapur Durbar Squar, Patan Durbar square, Changunarayan temple, Bouddhanath and Pashupatinath temple. In the past, the Government of Nepal ignored the value of Sankhu. That will be repeated again. Stop to threaten us as your burden. Stop showing dance of terror.